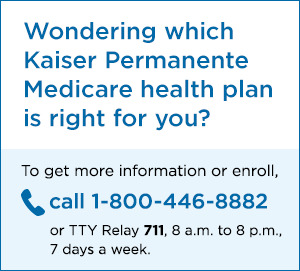 Kaiser Permanente Washington offers Medicare Advantage HMO plans that include Part D prescription drug coverage. Take a look at the different plan benefits, what medications are covered, and what in-network pharmacies are near you. Call us for help finding the plan that’s right for you. View costs, features, and benefits of Kaiser Permanente Medicare Advantage (HMO) health plans in Washington that include Part D prescription drug coverage. See if your current medications are on our list of covered drugs. You'll be glad to know that we use a drug formulary developed by a team of physicians. They regularly look at the safety and cost of drugs, selecting the most effective and cost-effective drug in each class. It's one of the most important ways we safeguard your health and help keep drug costs affordable. Kaiser Permanente owns and operates its own pharmacies at Kaiser Permanente Washington medical offices, and also has contracts with pharmacies that meet Centers for Medicare & Medicaid Services (CMS) requirements for pharmacy access in your area. Learn more about the MTM program, which is offered to eligible Medicare Part D enrolleees who have multiple chronic conditions and take several medications.